A gamma-ray burst of light from the enormous explosion of a star more 12.1 billion years ago — shortly after the Big Bang — recently reached Earth and was visible in the sky. Gamma-ray bursts are believed to be the catastrophic collapse of a star at the end of its life. Farley Ferrante, a graduate student in Souther Methodist University's Department of Physics, who monitored the observations along with two astronomers in Turkey and Hawaii, says they were first on the ground to observe the burst and to capture an image, using the McDonald Observatory in the Davis Mountains of West Texas. Recorded as GRB 140419A by NASA's Gamma-ray Coordinates Network, the burst was spotted at 11 p.m. April 19 by SMU's robotic telescope, ROTSE-IIIB. "As NASA points out, gamma-ray bursts are the most powerful explosions in the universe since the Big Bang," he said. "These bursts release more energy in 10 seconds than our Earth's sun during its entire expected lifespan of 10 billion years." "Gamma-ray bursts may be particularly massive cousins to supernovae, or may correspond to cases in which the explosion ejecta are more beamed in our direction. By studying them, we learn about supernovae," Kehoe said. Scientists weren't able to detect optical light from gamma-ray bursts until the late 1990s, when telescope technology improved. Among all lights in the electromagnetic spectrum, gamma rays have the shortest wavelengths and are visible only using special detectors. Gamma-ray bursts result from hot stars that measure as enormous as 50 solar masses. The explosion occurs when the stars run out of fuel and collapse in on themselves, forming black holes. Outer layers detonate, shooting out material along the rotation axis in powerful, high-energy jets that include gamma radiation. As the gamma radiation declines, the explosion produces an afterglow of visible optical light. The light, in turn, fades very quickly, said Kehoe. Physicists calculate the distance of the explosion based on the shifting wavelength of the light, or redshift. "The optical light is visible for anywhere from a few seconds to a few hours," Kehoe said. "Sometimes optical telescopes can capture the spectra. This allows us to calculate the redshift of the light, which tells us how fast the light is moving away from us. This is an indirect indication of the distance from us." "That means that GRB 140419A exploded about 12.1 billion years ago," he said, "which is only about one and a half billion years after the universe began. That is really old." "At the time of this gamma-ray burst's explosion, the universe looked vastly different than it does now," Kehoe said. "It was an early stage of galaxy formation. There weren't heavy elements to make Earth-like planets. So this is a glimpse at the early universe. Observing gamma-ray bursts is important for gaining information about the early universe." 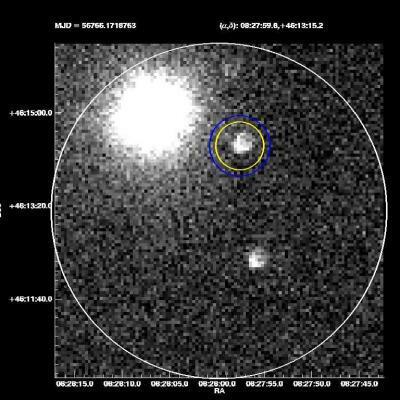 GRB 140419A's brightness, measured by its ability to be seen by someone on Earth, was of the 12th magnitude, Kehoe said, indicating it was only 10 times dimmer than what is visible through binoculars, and only 200 times dimmer than the human eye can see, Kehoe said. "The difference in brightness is about the same as between the brightest star you can see in the sky, and the dimmest you can see with the naked eye on a clear, dark night," Kehoe said. "Considering this thing was at the edge of the visible universe, that's an extreme explosion. That was something big. Really big." 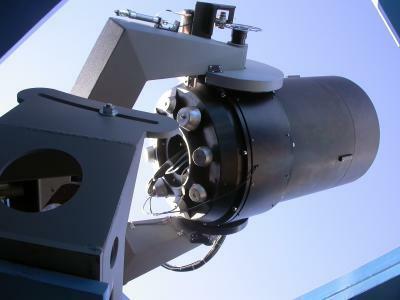 SMU's Robotic Optical Transient Search Experiment (ROTSE) IIIb is a robotic telescope. It is part of a network of ground telescopes responsive to a NASA satellite that is central to the space agency's Swift Gamma-Ray Burst Mission. SMU's ROTSE IIIb at the McDonald Observatory, Fort Davis, Texas had the earliest and brightest observation from the ground of a gamma-ray burst that occurred more than 12 billion years ago. The telescope is part of the Robotic Optical Transient Search Experiment, which has telescopes in four locations on Earth to cover the entire sky in search of gamma-ray bursts. Credit: ROTSE Collaboration. When the Swift satellite detects a gamma-ray burst, it instantly relays the location. Telescopes around the world, such as SMU's ROTSE-IIIb, swing into action to observe the burst's afterglow and capture images, said Govinda Dhungana, an SMU graduate student who participated in the gamma-ray burst research. SMU's ROTSE-IIIb observes optical emission from several gamma-ray bursts each year. It observed GRB 140419A just 55 seconds after the burst was detected by Swift. "We have the brightest detection and the earliest response on both of those because our telescope is fully robotic and no human hands were involved," Ferrante said. Ferrante was first to check observations on GRB 140423A and so is first-author. Tolga Guver, associate professor in the Department of Astronomy and Space Sciences at Istanbul University, Turkey, is second author. On GRB 140419A, Guver is first author and Ferrante is second.